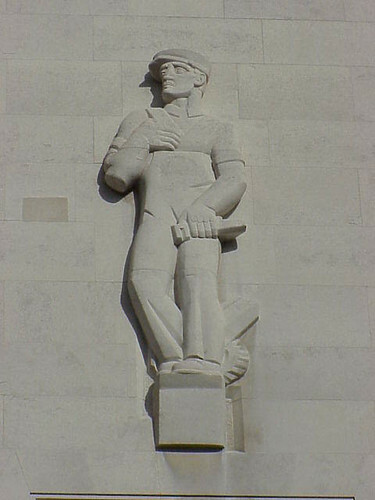 This building at 66 Portland Place, London is the home of the Royal Institute of British Architects (RIBA). 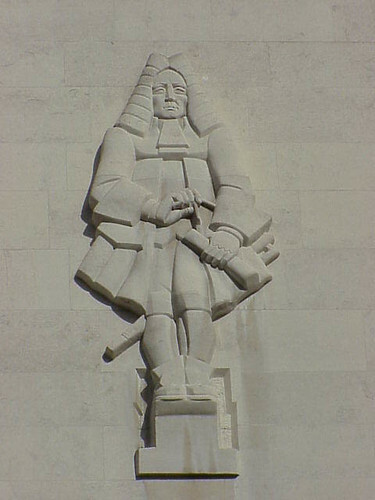 Designed by George Grey Wornum it was officially opened in November 1934 by King George V and Queen Mary. 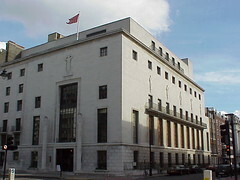 In 1970 it became the first modern building to recieve Grade II* listing. 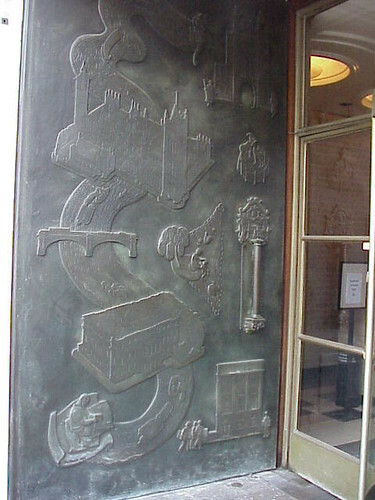 The entrance has two huge bronze doors bearing a relief of the Thames river with some of London's buildings by James Woodford. 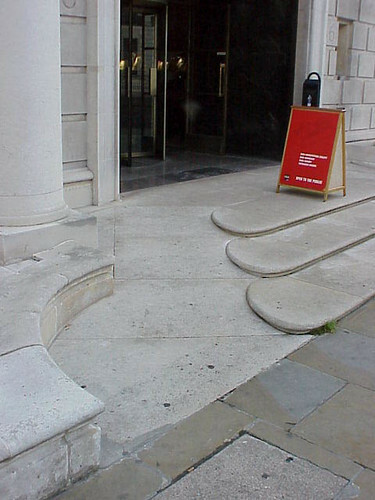 The left door (above) includes the Houses of Parliament and Guildhall but I paticularily liked the way the three rounded steps combine with a ramped paths on either side leading to the entrance. 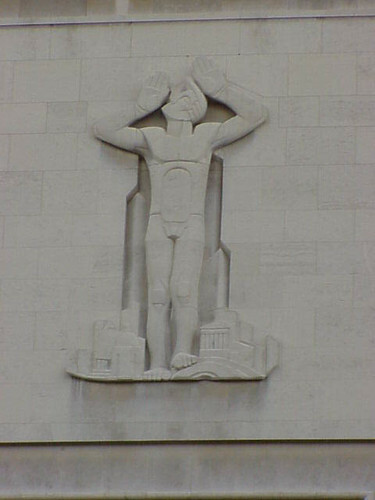 Woodford also designed the two figures that stand on columns either side of the doorway who with a third figure high on the facade by Bainbridge Copnall represent the spirit of man and woman as creative forces of architecture. 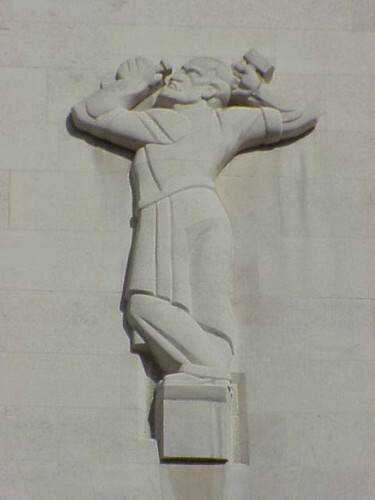 High on the side of the RIBA building there are five figures also by Copnall. Yes, I love the rounded steps and ramp. I've never seen anything quite like that before. Really unique. Lisa, there is so much going on inside this building as well. You'd love it. 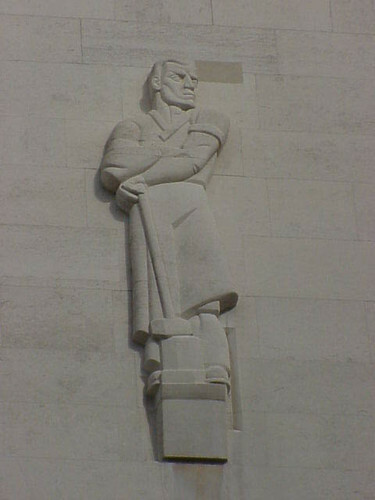 Design principles have changed all types of buildings to help make them more beautiful and artistic in their styles. I am a strong believer that time can be put into the design process to create buildings that are sustainable, beautiful, functional and of great quality. The building process should then be able to deliver these qualities. Fantastic idea & design. Really it was very modern. Love it. 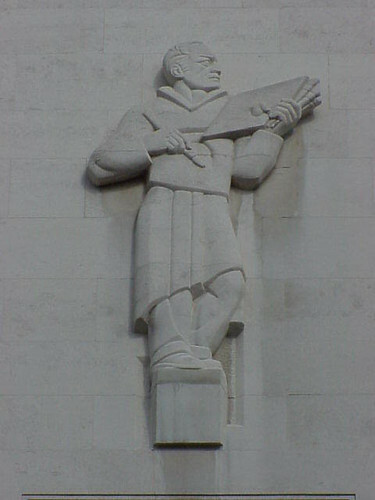 And very fitting for a society of architects.